About her video work at dOCUMENTA (13) on the complex histories of the Dar ul-Aman Palace in Kabul and the Fridericianum in Kassel. A Brief History of Collapses (2011-12) is Mariam Ghani’s most ambitious project to date. 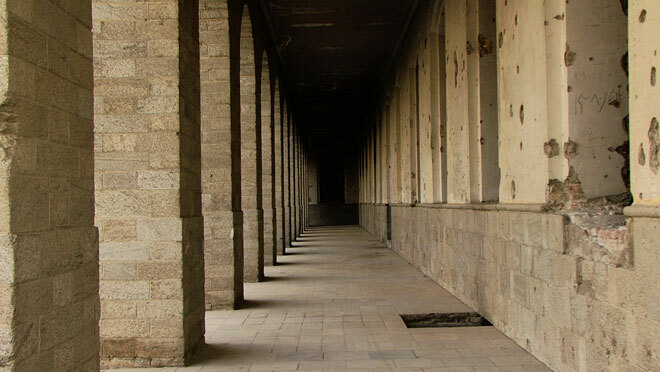 The two-channel video, premiering at dOCUMENTA (13), addresses the complex histories of the Dar ul-Aman Palace in Kabul, Afghanistan and the Museum Fridericianum in Kassel, Germany. Erected in 1929, the palace is now in ruins, though it was once part of King Amanullah's plan to build a utopian new city in Afghanistan. After the Allied bombing of Kassel in 1943, the Fridericianum, which was finished in 1779, was also in shambles. It was eventually rebuilt and since 1955 has served as the primary venue for Documenta. The video installation will also be presented in Kabul at the Queen's Palace in the Bagh-e-Babur gardens, as part of an exhibition with work by dOCUMENTA (13) artists who produced projects in both Kabul and Kassel. As an American of Afghan and Lebanese descent, Ghani’s background and extensive research in Afghanistan serve as a continual source of inspiration for her work, through which she mines difficult and often overlooked moments of political change and social upheaval. She is an astute observer of history, enabling her to thoughtfully weave narratives into webs of images, sounds, and sensations. Her understanding of the region from a perspective that is neither touristic nor familiar, neither completely foreign nor truly native, places her in a unique position to navigate a culture that is rarely understood beyond binary designations. Having engaged in policy work in Central Asia, Ghani is privy to a world few artists experience. A Brief History of Collapses brings together various facets of her practice that have otherwise operated on disparate platforms, allowing her interest in movement, collective memory, and public policy to coalesce. One of Ghani’s best-known projects, Index of the Disappeared (2004-present), an ongoing collaboration with Chitra Ganesh, is an archive consisting of redacted government documents, selected texts, and case studies. It also serves as a platform for dialogue about post-9/11 disappearances, detentions, deportations, renditions, and redactions. Ghani’s research regarding socio-political struggles and government suppression is perhaps most direct in this particular endeavor, though they are recurring preoccupations throughout her practice. Kabul 2, 3, 4 (2002-07) is a series of short documentary films shot in consecutive years in Kabul. In many ways they are the aesthetic counterpoint to her Index project, where a city struggling to survive is preserved through glimpses of the streets, citizens, and architecture that keep it afloat. Using continuous tracking shots in A Brief History of Collapses, the video guides the viewer through time and space, endlessly chasing an undefined endpoint. Michel de Certeau’s distinction between space and place and his conclusion that "space is a practiced place," is useful when considering Ghani’s approach to locale and movement. Tainted by wars, revolving power structures, uprisings, and collapses, the Dar ul-Aman Palace and the Museum Fridericianum serve as somewhat reluctant repositories. They are indeed spaces—occupied or not—that have never been and will never be static. Like Ghani’s past videos produced collaboratively with dancers, A Brief History of Collapses synthesizes architecture, history, literature, and cinema. It engages the viewer in an intimate dialogue about specificity and addresses memory lapses and historical fissures. "The obligation to forget" or rather "forgetting to remember" that Homi Bhabha has discussed in his writing about time, narrative, and the margins of the modern nation describes the manner in which national identity and collective histories are made visible. The Dar ul-Aman Palace in Kabul and the Museum Fridericianum in Kassel, which have served convoluted roles throughout history, stand as testaments to the permutable identities of both cities—and the people they have served. Pursued by cameras traveling throughout the architecture and edited to imply seamless movement between the two structures, several figures move in and out of view. According to Ghani, "one camera chases a ghost of the past that can never be fully assimilated or reconciled, while the other chases an unrealized vision, the possible future that can never be made fully real in the present." The poetic voiceover accompanying the video steers the viewer between recent history and the present day. It is the ideal companion to the more authoritative Afghanistan: A Lexicon (Hatje Cantz, 2011), the notebook Mariam Ghani produced in collaboration with Ashraf Ghani as part of dOCUMENTA (13)’s publication series 100 Notes, 100 Thoughts. Filled with anecdotes, facts, figures, and archival images, the lexicon covers seventy-one terms relating to the history of twentieth-century Afghanistan. Both endeavors emphasize that they cannot or perhaps should not be taken at face value, as there are many possible versions of these stories. The video also addresses the years the Brothers Grimm spent in the Fridericianum, where they worked as librarians and found inspiration for their fairytales. Not only are the Grimm tales full of horror, mirroring the social and political tragedies detailed in the lexicon, their writing exemplifies the kind of non-linear storytelling that appeals to Ghani, and which she utilizes to great effect in A Brief History of Collapses. By emulating the narrative structure of fairytales, she is able to fuse historical events with assumptions, hearsay, and myth. As the video commences, she offers the following disclaimer. Cleverly constructed and seamlessly executed, the stories of the Dar ul-Aman Palace and the Museum Fridericianum as told in A Brief History of Collapses are tales certainly worth telling. Michel de Certeau, The Practice of Everyday Life (Berkeley: University of California Press, 1984), 117. Homi K. Bhabha, The Location of Culture (London and New York: Routledge, 1994), 160-161. Mariam Ghani, personal email (May 2012). Mariam Ghani, voiceover narration from A Brief History of Collapses (2011-12). Independent curator and writer. Based in Atlanta, GA, USA.